Event Description : The Vinyl Records - Thursday Live! The Vinyl Records (aka TVR), is a 4 piece post-punk-indie-rock band based in New Delhi that came together in Feb 2010. The band was formed by Banu, Minam and Mithy who all hail from Arunachal Pradesh. The band was almost on a year hiatus from performing and meanwhile, the girls started jamming and coming up with ideas, The final touch of the band came when they were joined by the present vocalist and keytarist Cheyyrian Bark from Assam in Jan 2011. The band never looked back ever since, starting and promising to take Delhi by a bang in the year 2011!! 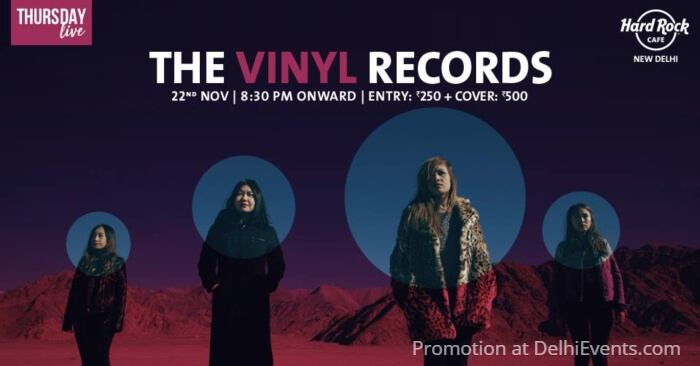 The Vinyl Records (TVR) are making a whole lot of noise all their own, exciting the ears of India’s Rolling Stone, RSJ, Tehelka, Cosmopolitan and Marie Claire magazine editors (who have featured TVR on their pages) in the process.